– Iowa Select Volleyball Club is excited to announce the hiring of Shauna Cotton to the Iowa Select Family. Shauna will work in many different areas within the organization and the organization is beyond excited to have Shauna join our volleyball family! Iowa Select’s Co-Director, Frank Flanagan, is also ecstatic about Shauna joining the family: “A large aspect we have always preached to our athletes is growth mindset and the idea that you can always get better. Kyle and I at the end of every year are always looking at opportunities to get better so that our athletes can have a great experience and have all the opportunities in the world to become the best volleyball player that they want to be. Bringing Shauna on board is the start of an off-season where we are looking to make the necessary changes to improve where we can get better. Our day to day organization, communications, sponsorships, and many of the behind the scenes jobs takes a huge step forward. With that, our gym and training take a huge step forward as now I can spend most of my energy and focus on training, which is ultimately what we want to be great at! We’ve gotten the pleasure to know Shauna over the last couple of years while she has Co-Directed PV Volleyball Club, and we’re excited to have such a quality person, mother, and volleyball fanatic on our side and we know our families will appreciate the improved blend of organization and high-quality training”. Shauna Cotton is also excited about the future moving forward, “I’m excited about the opportunity to join the Iowa Select Staff and help on the administrative side of the club. Volleyball is a big part of my family’s life and I’m thrilled to be a part of a growing quality volleyball club with some of the top coaches in the area! I look forward to meeting all the players and parents in the very near future! 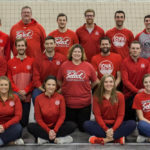 GO SELECT!” Iowa Select Volleyball is a non-profit youth organization that specializes in the growth, training, and education of our area’s girls and boys volleyball players. We have operated out of Rock Island, IL this past year but you can soon find us at our new home, QC Volleyball Factory, in Downtown Davenport in the coming month! Please visit us at www.iowaselectvbc.com for club tryout details, youth programs, tournaments, clinics and lessons.